Continuing this year's rapid clearout of the Stateside docket, this morning the Pope named Bishop Gregory Aymond of Austin as the fourteenth archbishop of New Orleans. Ordained a priest for the Crescent City in 1975 and its auxiliary bishop from 1997 until his transfer to Texas' capital three years later, the 59 year-old choice -- the first NOLA native ever to lead the Big Easy's local church -- succeeds Archbishop Alfred Hughes, who reached the retirement age of 75 in December 2007. A well-seasoned, pastoral, conciliatory figure who's led one of the Southern church's "boomtown" dioceses through sustained growth (threefold uptick in priestly vocations included), Aymond returns to a hometown still rebuilding from 2005's Hurricane Katrina, the worst natural disaster in American history. But as he takes over from a prelate whose seven-year tenure proved unpopular in many quarters, both as a result of Hughes' history in the abuse-tarred Boston chancery over earlier decades and his more recent task of handling the 370,000-member archdiocese's need for post-storm adjustments, the new man on Jackson Square arrives with the twin benefits of knowing the lay of the land on Day One and, so it's said, enjoying high regard among his once and future presbyterate, much of which he formed at the city's Notre Dame Seminary, where the archbishop-elect served as rector for 14 years. Suffice it to say, all the local cred will come in handy. A wonkish, media-savvy cleric, New Orleans' 17th chief shepherd inherits a local church that, according to rough estimates, lost a quarter of its Catholics after Katrina and sustained some $300 million in property damage, closing a quarter of its parishes as a result, among other controversial moves. The post-storm realignment has been tougher than usual given the community's extra-sensitive mood, and emotions were prominently stoked after sit-in demonstrations by members of two closed parishes were ended by city police, who arrested several protestors in a January operation that saw one shuttered church's door broken down. In recent weeks, Aymond ordained five priests and six transitional deacons for the 425,000-member Austin church, whose Catholic population has doubled since 1990. Last weekend, Hughes ordained three men for the archdiocese. On a historic note, today's move gives New Orleans a distinction without precedent on these shores: four living archbishops. Beyond Aymond and Hughes, Archbishops Francis Schulte (1989-2001) and Philip Hannan (1965-89) are well and kicking, with the eleventh archbishop -- who ordained his newest successor to the priesthood -- still widely viewed as the city's "first citizen." Its history dating to 1682, the Crescent City see -- formally founded in 1793 as the diocese of Louisiana and the two Floridas -- is the nation's second oldest local church. In more recent times, it's the only Stateside diocese to have its own iPhone application. According to early word, the archbishop-elect will be installed in the French Quarter's Cathedral-Basilica of St Louis on Thursday, 20 August. 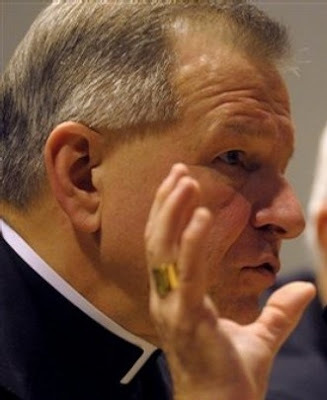 Along the way, Aymond will join the other four newly-named American archbishops -- Allen Vigneron of Detroit, Tim Dolan of New York, St Louis' Robert Carlson and Omaha's George Lucas -- in receiving the metropolitan's pallium from B16 at the Vatican on 29 June. 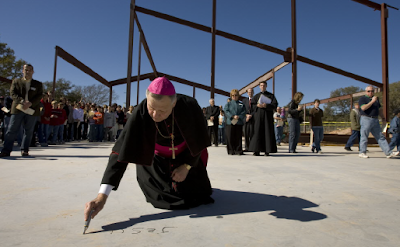 The new vacancy at Austin now leaves seven US dioceses currently without a resident bishop. With Hughes' retirement, another eight sees are led by an ordinary serving past the age-limit. "A Witness to the World"
"A Culture Prevalent For Far Too Long"
"As a People Made One"
In "Rome of the West," "Soul" Meets "Body"